The iPod accessories market may have just hit a new low. For Tivoli Audio has chosen to dub its new dockable iPod stereo the iYiYi - which is exactly the phrase you use when you find out what it's called. "With all the 'i' products on the market, it was time to produce the iYiYi digital home entertainment system as a consumer electronics product that once again distinguishes Tivoli Audio from all the others." The company has certainly managed that. Silly name notwithstanding Tivoli Audio does have a good reputation for making iPod boxes, so we expect the iYiYi (shudder) to deliver good sound quality for its $300 (£155) asking price. 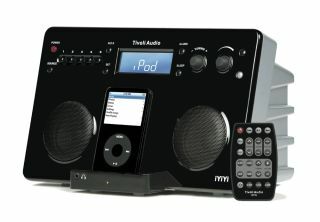 Key features include compatibility with all current iPod models including the new iPod nano and iPod video, and the iYiYi also includes an RDS FM/AM clock radio with alarm and a credit-card sized remote. Perhaps it's just as well that this product is likely to be squirreled away into people's bedrooms. You would perhaps be a little embarrassed to justify your buying decision when your friends and family come around.